Reps. Steve Womack of Arkansas and Tom Cole of Oklahoma requested an investigation into the Pentagon’s handling of a controversial cloud contract known as JEDI. JEDI has provoked widespread criticism from the technology industry that the contract has been rigged from the start to favor Amazon. The request follows The Daily Caller News Foundation’s report in August detailing how a former senior adviser to Defense Secretary James Mattis, Sally Donnelly, had consulted for Amazon Web Services prior to entering the Pentagon. Two members of the House Appropriations Committee requested an investigation Monday into the Pentagon’s handling of its $10 billion winner-take-all cloud computing contract following widespread criticism that the deal has been rigged from the start to favor Amazon. Amazon Web Services is the only cloud computing platform that meets all the specifications of the Joint Enterprise Defense Infrastructure (JEDI) program, which stands to be one of the largest stand-alone technology contracts the federal government’s ever awarded at up to $10 billion over 10 years. The Department of Defense is expected to select a winner for the contract in April. “It has come to our attention through media reports that individuals who held, or hold, high ranking positions in the Department have access to the specific contractor,” Reps. Steve Womack of Arkansas and Tom Cole of Oklahoma wrote in a letter Monday to Department of Defense Acting Inspector General Glenn Fine. The “specific contractor” in question appears to be a reference to Amazon Web Services. “Our current understanding is that these individuals, in direct contrast with the Federal Acquisition Regulation and DoD Ethics Policy, had involvement in the development of the JEDI program,” the letter continues. Two days before Donnelly departed the DOD for the private sector on March 9, the Pentagon issued a draft request for proposal for JEDI, which many in the IT industry complained provided an unfair advantage for Amazon’s cloud platform. 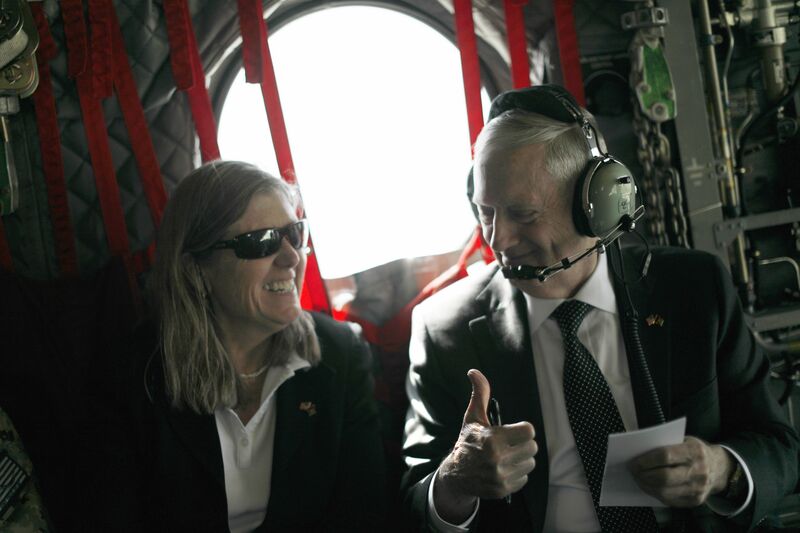 US Defence Secretary James Mattis (R) gestures to senior advisor Sally Donnelly as they arrive by helicopter at Resolute Support headquarters in the Afghan capital Kabul on April 24, 2017. Leaders in the technology industry have questioned why the Pentagon chose to take the controversial winner-take-all route for JEDI rather than following the industry standard of leveraging multiple cloud providers. Only Amazon holds the necessary certifications for the contract. Microsoft announced in October it was on track to obtain the required federal security certifications by early 2019. IBM and Oracle, two of Amazon’s competitors in the cloud industry, have filed protests of the JEDI contract with the Government Accountability Office. IBM General Manager Sam Gordy referenced industry concerns that the contract provides an unfair advantage to a “specific vendor” in his statement announcing the company’s protest. “Throughout the year-long JEDI saga, countless concerns have been raised that this solicitation is aimed at a specific vendor. At no point have steps been taken to alleviate those concerns,” Gordy said. Google announced wouldn’t compete for the contract, in part because of the Pentagon’s single-vendor approach.